Através do nosso site – English Made in Brazil < – recebemos frequentemente perguntas sobre o aprendizado de línguas na infância. 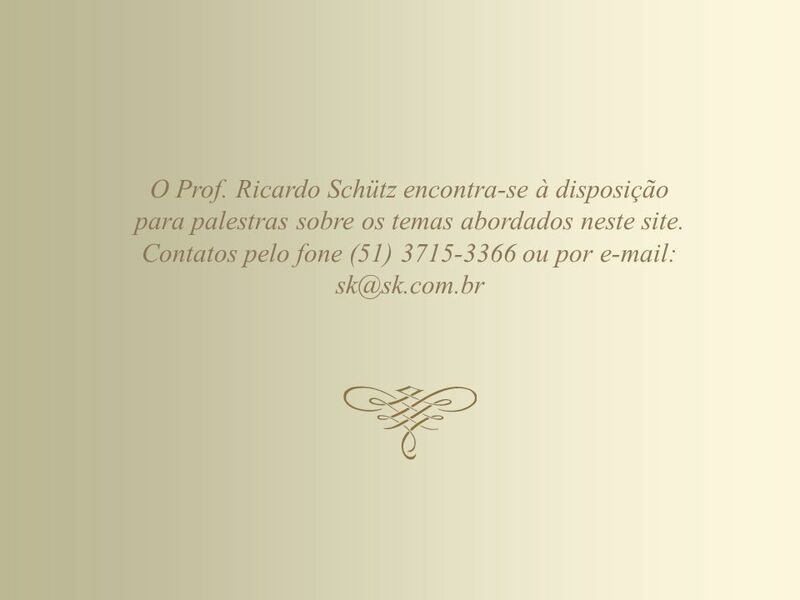 Este conjunto de vinte perguntas sintetiza as dúvidas e preocupações mais comuns de todos aqueles que têm filhos ou que trabalham com o ensino de línguas na infância. 4 Is not aware of the difference between acquisition and learning. 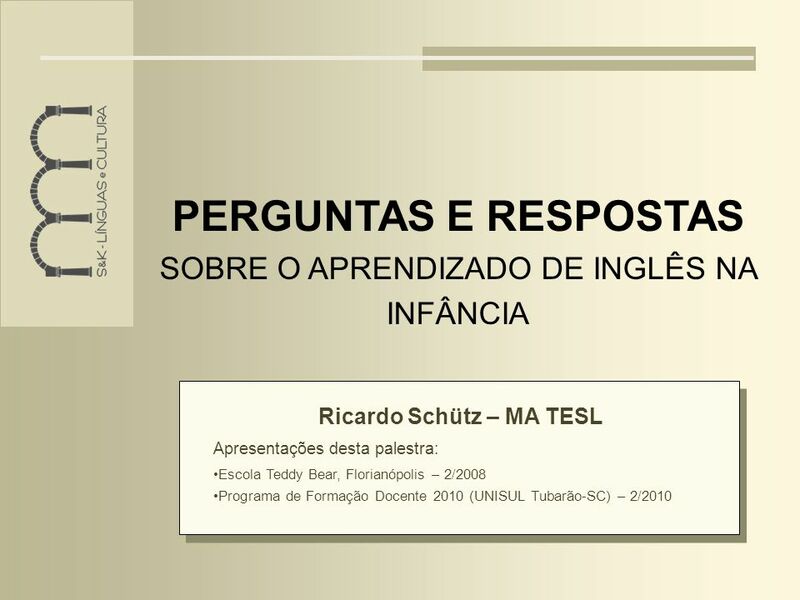 APRENDIZADO NA INFÂNCIA – PERGUNTAS E RESPOSTAS Acquisition (assimilação natural) is result of a subconscious process very similar to the process children undergo when they acquire their first language. It requires meaningful interaction in the target language and culture environment - natural communication - in which speakers are con-centrated not in the form of their utterances, but in the communicative act. It is learning through experience. Comments: Is not aware of the difference between acquisition and learning. Believes in self-study based on a structured plan. Ignores the fact that language is an ability acquired naturally as a result of human interaction. Especially children acquire the local language easily and quickly. 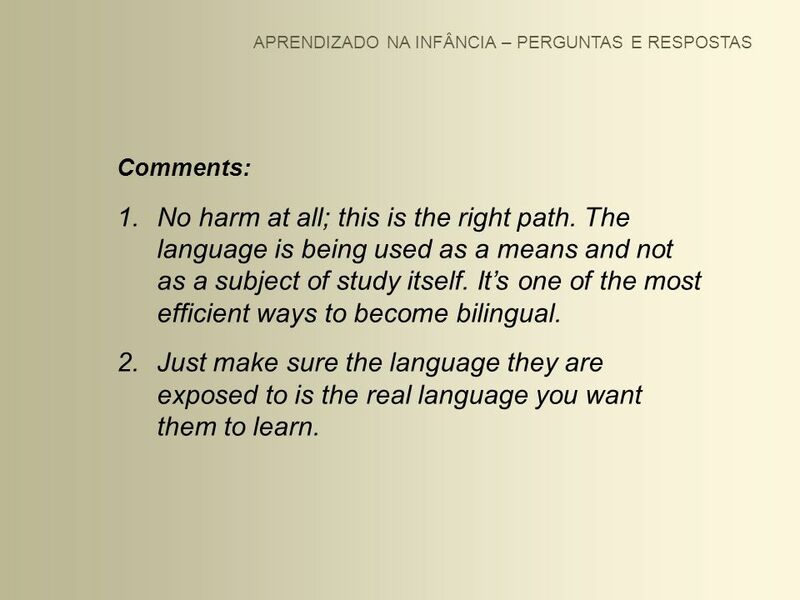 Learning (estudo formal) is the product of formal instruction and it comprises a conscious process with intellectual efforts which result in conscious knowledge 'about' the language, for example knowledge of grammar rules. 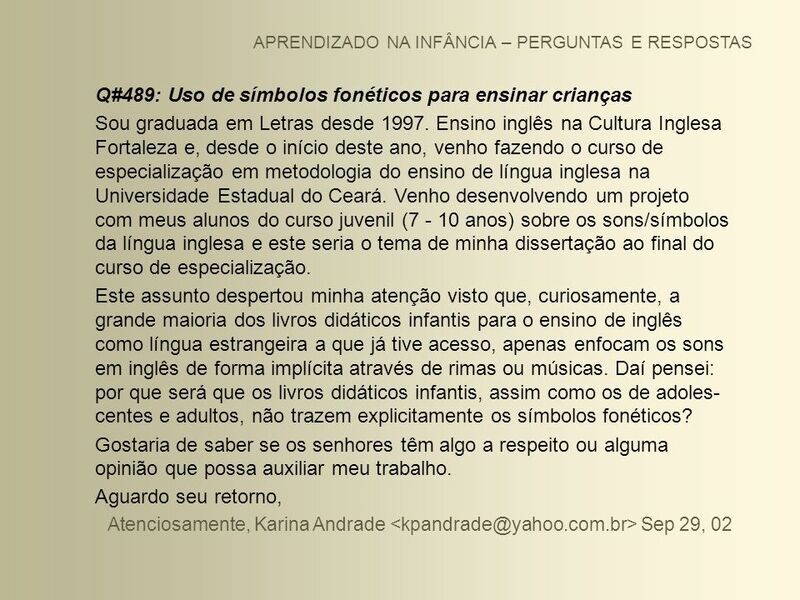 5 Qual a idade ideal para começar o ensino de uma língua? Por que? 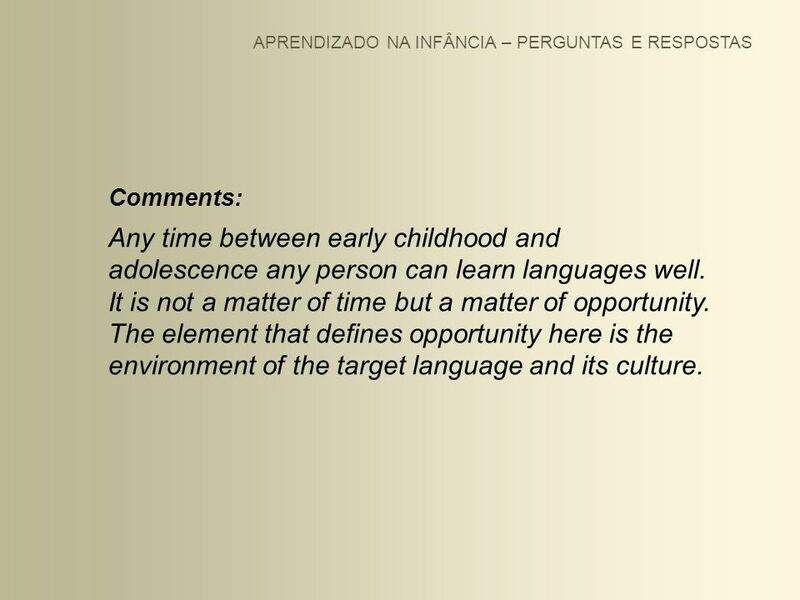 Comments: Any time between early childhood and adolescence any person can learn languages well. It is not a matter of time but a matter of opportunity. The element that defines opportunity here is the environment of the target language and its culture. Comments: She is one more victim of the common misconception that “to learn a language” has only one clear meaning. 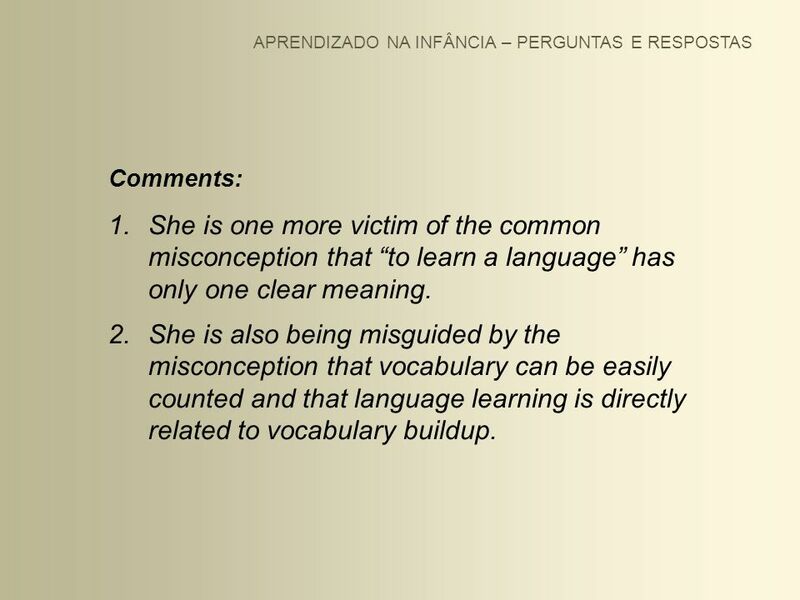 She is also being misguided by the misconception that vocabulary can be easily counted and that language learning is directly related to vocabulary buildup. 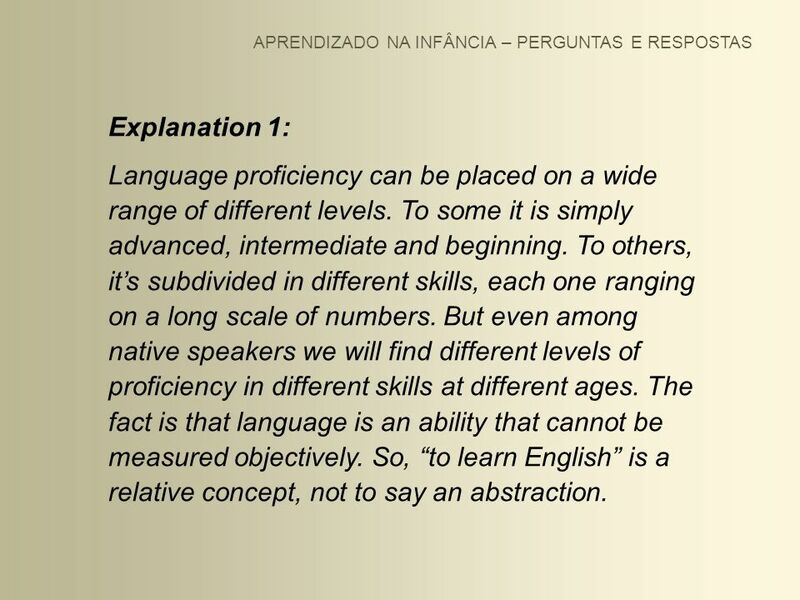 Explanation 1: Language proficiency can be placed on a wide range of different levels. To some it is simply advanced, intermediate and beginning. To others, it’s subdivided in different skills, each one ranging on a long scale of numbers. But even among native speakers we will find different levels of proficiency in different skills at different ages. The fact is that language is an ability that cannot be measured objectively. So, “to learn English” is a relative concept, not to say an abstraction. 10 How should we count the vocabulary we “know”? 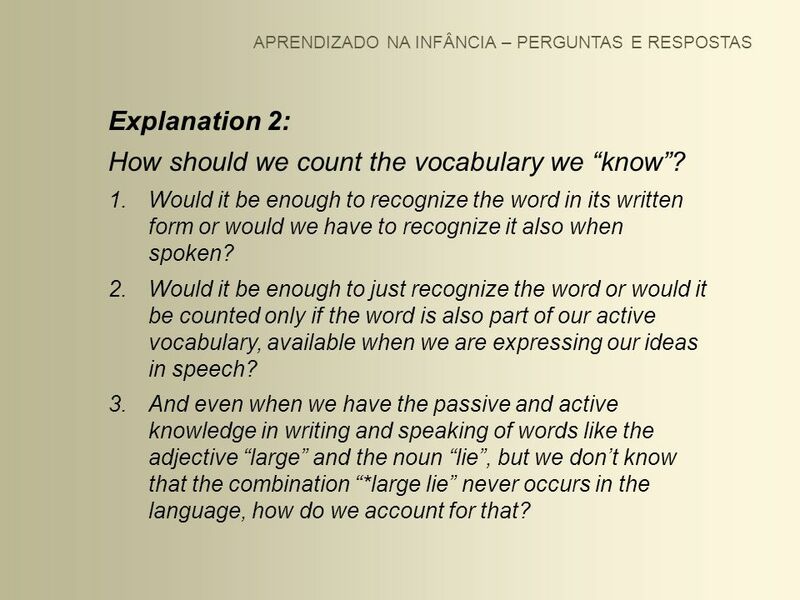 APRENDIZADO NA INFÂNCIA – PERGUNTAS E RESPOSTAS Explanation 2: How should we count the vocabulary we “know”? Would it be enough to recognize the word in its written form or would we have to recognize it also when spoken? Would it be enough to just recognize the word or would it be counted only if the word is also part of our active vocabulary, available when we are expressing our ideas in speech? And even when we have the passive and active knowledge in writing and speaking of words like the adjective “large” and the noun “lie”, but we don’t know that the combination “*large lie” never occurs in the language, how do we account for that? When counting the vocabulary we know, words like the noun “hinge” or the verb “chew” will have the same weight as “house” or “drink”? How much of a compromise to our fluency not knowing “hinge” and “chew” will be? How can we equate in our vocabulary inventory the fact that some words are 20 or 30 times more likely to occur than others? What weight in our counting shall we give to verbs like “take” and “get”, for which we can easily find more than 10 different meanings? How to include the lexical ambiguity of words in our counting formula? 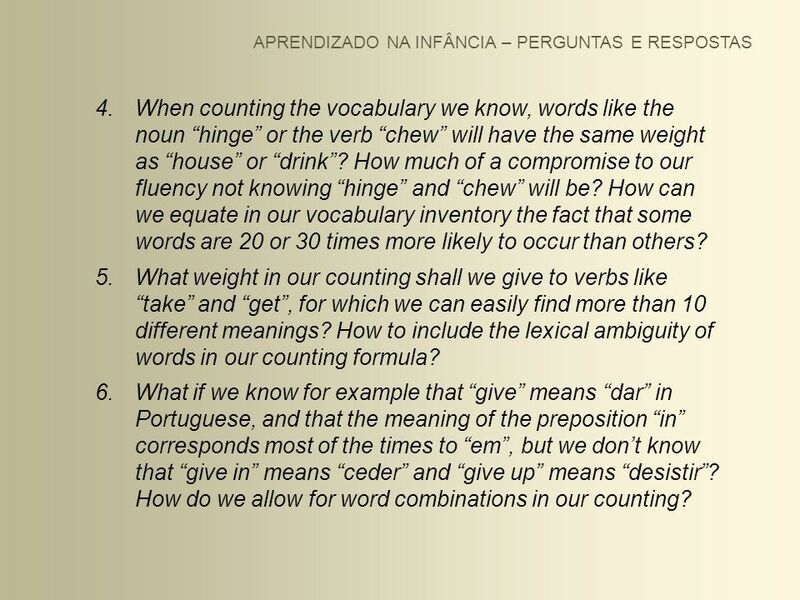 What if we know for example that “give” means “dar” in Portuguese, and that the meaning of the preposition “in” corresponds most of the times to “em”, but we don’t know that “give in” means “ceder” and “give up” means “desistir”? How do we allow for word combinations in our counting? Finally, how to equate content words like nouns and main verbs, which are more useful in conveying meaning, with function words like prepositions, articles, determiners and pronouns? In conclusion, vocabulary is an important element of language but it’s virtually impossible to quantify vocabulary and unadvisable to correlate it with language proficiency. The final and only answer to her question is: children can learn a lot faster. Comments: The critical age factor is a much discussed matter. 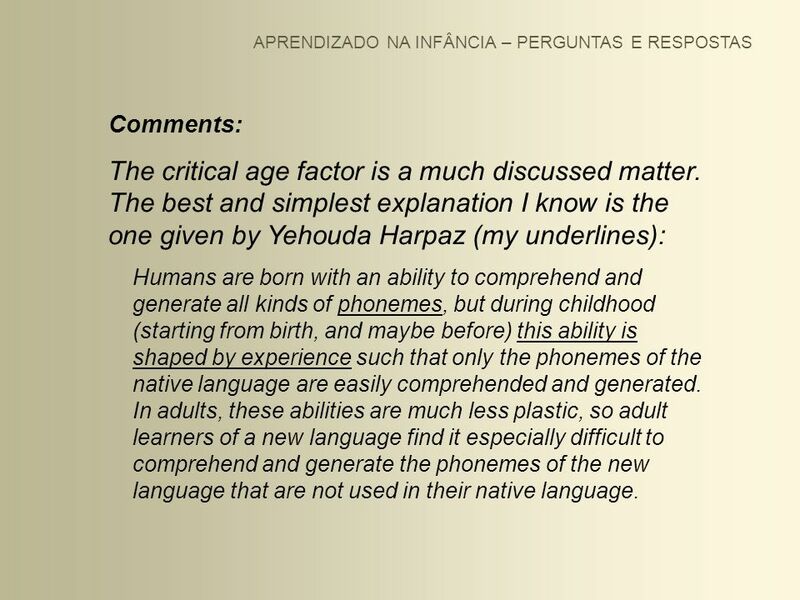 The best and simplest explanation I know is the one given by Yehouda Harpaz (my underlines): Humans are born with an ability to comprehend and generate all kinds of phonemes, but during childhood (starting from birth, and maybe before) this ability is shaped by experience such that only the phonemes of the native language are easily comprehended and generated. In adults, these abilities are much less plastic, so adult learners of a new language find it especially difficult to comprehend and generate the phonemes of the new language that are not used in their native language. At the time of learning to speak, the child learns to understand the world, and linguistic interaction forms most of the data in this learning. As a result, the learned neural structures that correspond to concepts tend to be associated with the neural structures that correspond to the words. 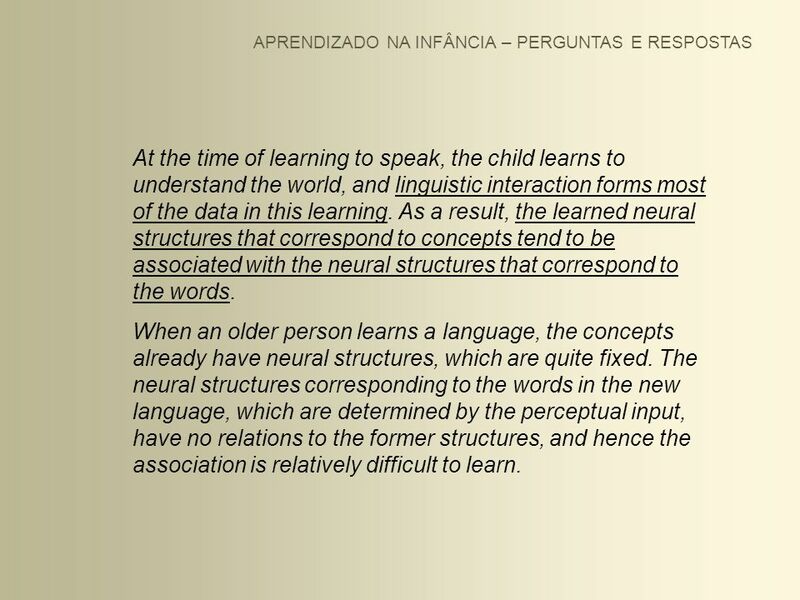 When an older person learns a language, the concepts already have neural structures, which are quite fixed. The neural structures corresponding to the words in the new language, which are determined by the perceptual input, have no relations to the former structures, and hence the association is relatively difficult to learn. Comments: Ignores the difference between acquisition and learning. We do not “teach” language to children but through the relationship we build with them we provide the language they absorb and acquire. Needs to understand that the language used is an essential part of the relationship between 2 people. Two languages cannot easily coexist in a relationship. 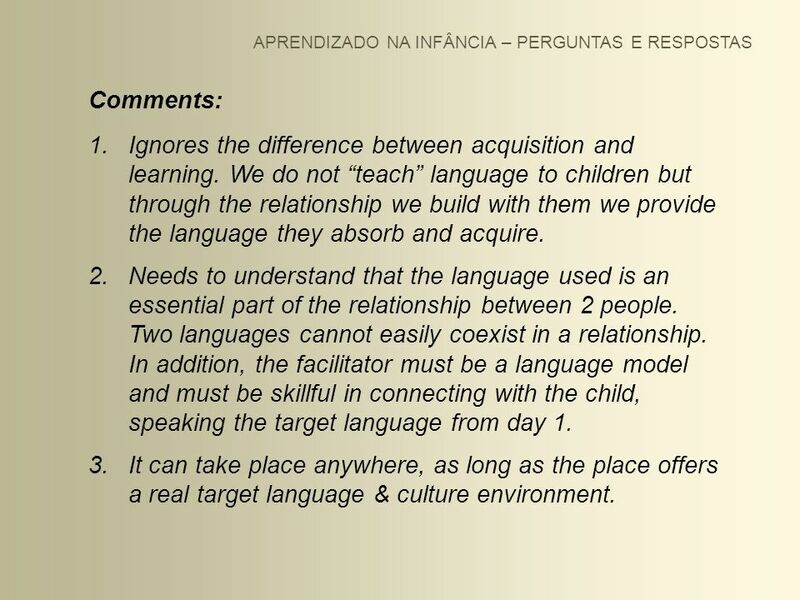 In addition, the facilitator must be a language model and must be skillful in connecting with the child, speaking the target language from day 1. It can take place anywhere, as long as the place offers a real target language & culture environment. 20 Do your best to find the right English environment for your child. 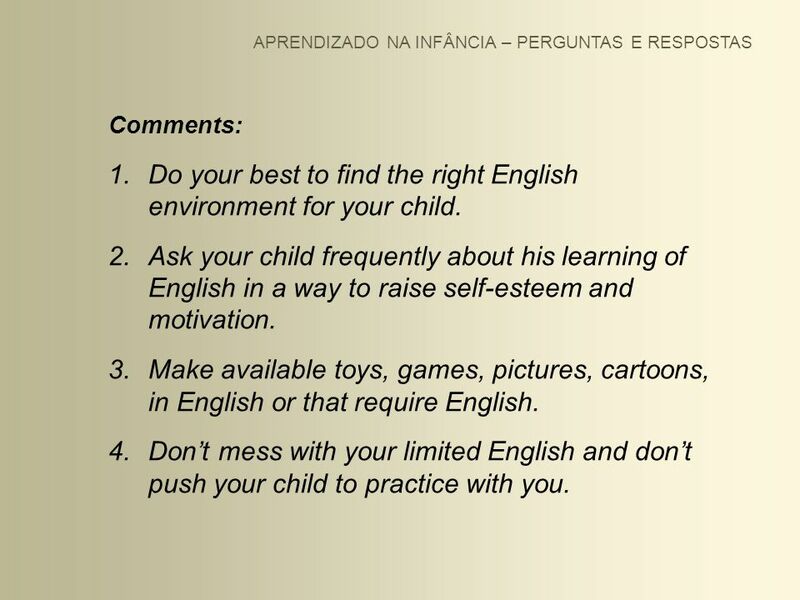 APRENDIZADO NA INFÂNCIA – PERGUNTAS E RESPOSTAS Comments: Do your best to find the right English environment for your child. Ask your child frequently about his learning of English in a way to raise self-esteem and motivation. Make available toys, games, pictures, cartoons, in English or that require English. Don’t mess with your limited English and don’t push your child to practice with you. Comments: No harm at all; this is the right path. The language is being used as a means and not as a subject of study itself. It’s one of the most efficient ways to become bilingual. Just make sure the language they are exposed to is the real language you want them to learn. Comments: Probably ignores the difference between acquisition and learning and for this reason gives too much importance to a lesson plan. Neglects the fact that language is primarily speech and oral input must prevail over the written language, especially when teaching English to children. Or maybe she is forced to work with too large a number of learners per class, which does not allow for an acquisition environment. 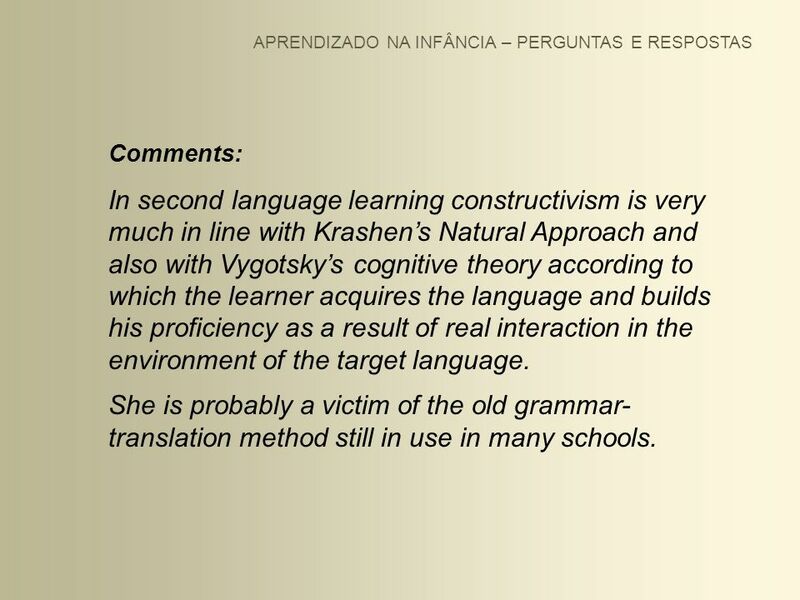 Comments: In second language learning constructivism is very much in line with Krashen’s Natural Approach and also with Vygotsky’s cognitive theory according to which the learner acquires the language and builds his proficiency as a result of real interaction in the environment of the target language. She is probably a victim of the old grammar- translation method still in use in many schools. My suggestion: Bring Portuguese into your home. Make it part of your son's learning environment. 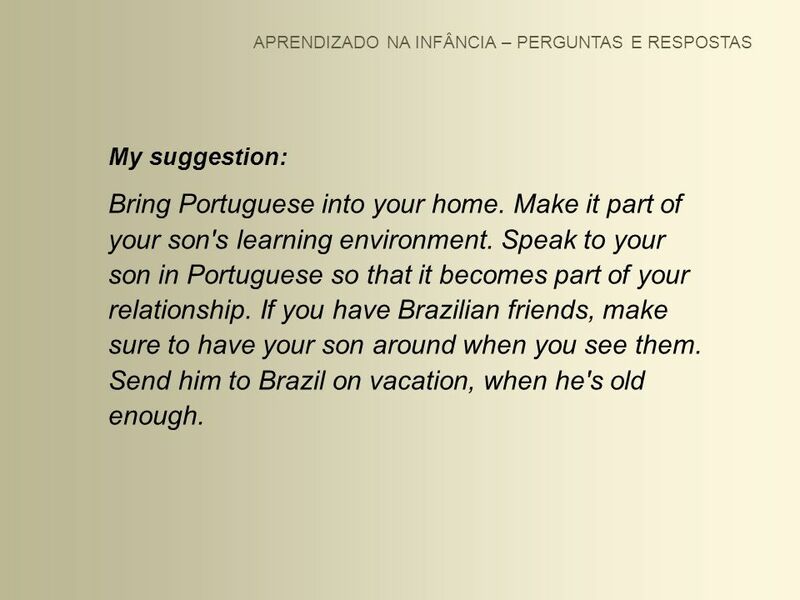 Speak to your son in Portuguese so that it becomes part of your relationship. If you have Brazilian friends, make sure to have your son around when you see them. Send him to Brazil on vacation, when he's old enough. 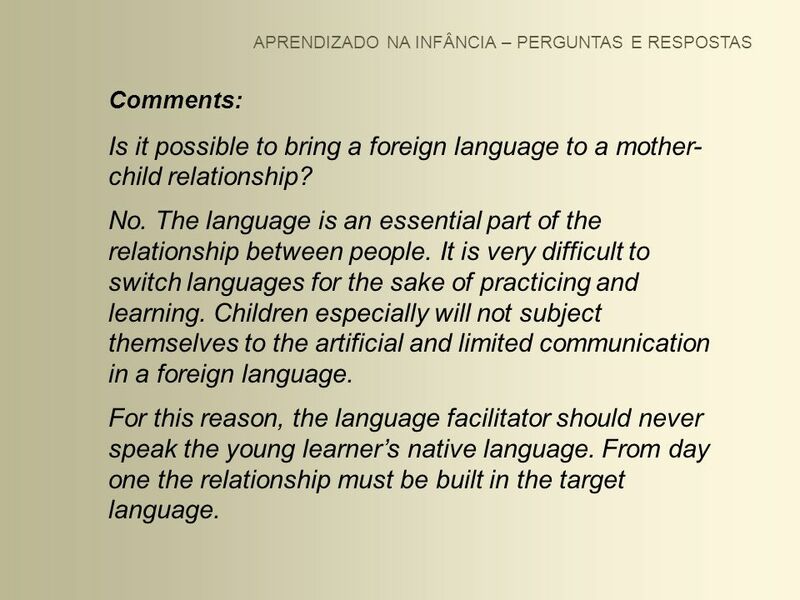 Comments: Is it possible to bring a foreign language to a mother- child relationship? No. The language is an essential part of the relationship between people. It is very difficult to switch languages for the sake of practicing and learning. Children especially will not subject themselves to the artificial and limited communication in a foreign language. 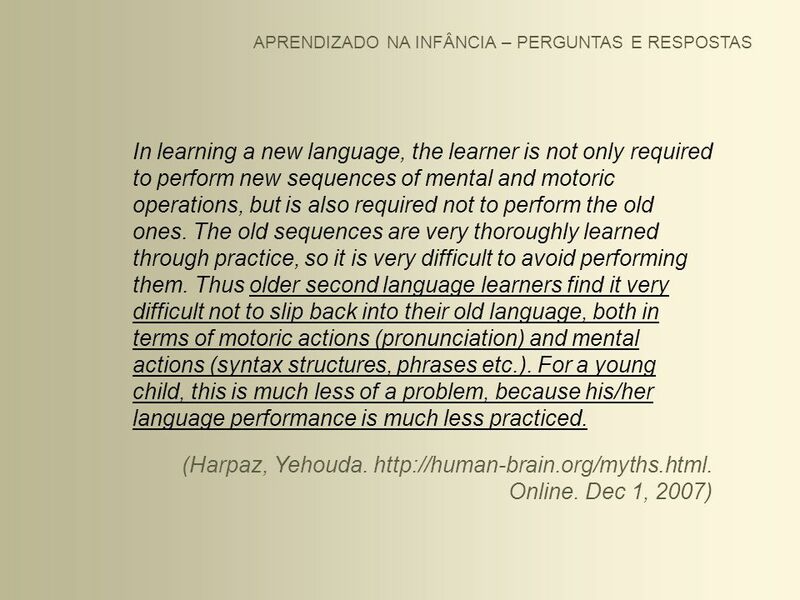 For this reason, the language facilitator should never speak the young learner’s native language. From day one the relationship must be built in the target language. 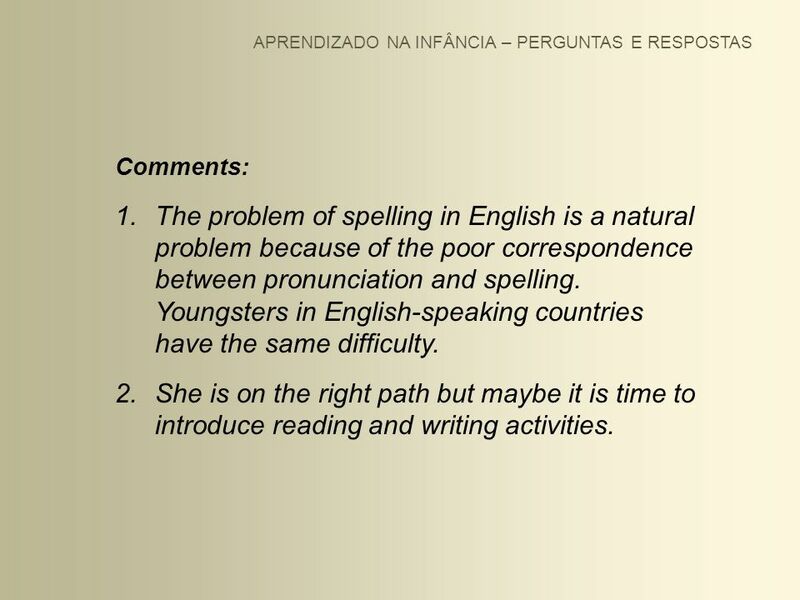 Comments: Let’s keep in mind that the correspondence between spelling and pronunciation in English is extremely poor. Therefore difficulties in spelling are quite natural. Remember the popularity of the “spelling bee” contests in English-speaking countries. 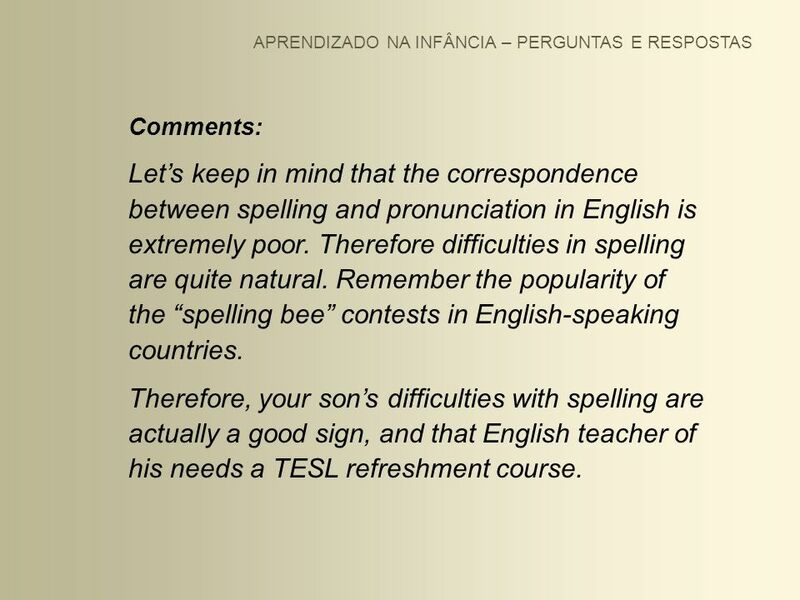 Therefore, your son’s difficulties with spelling are actually a good sign, and that English teacher of his needs a TESL refreshment course. 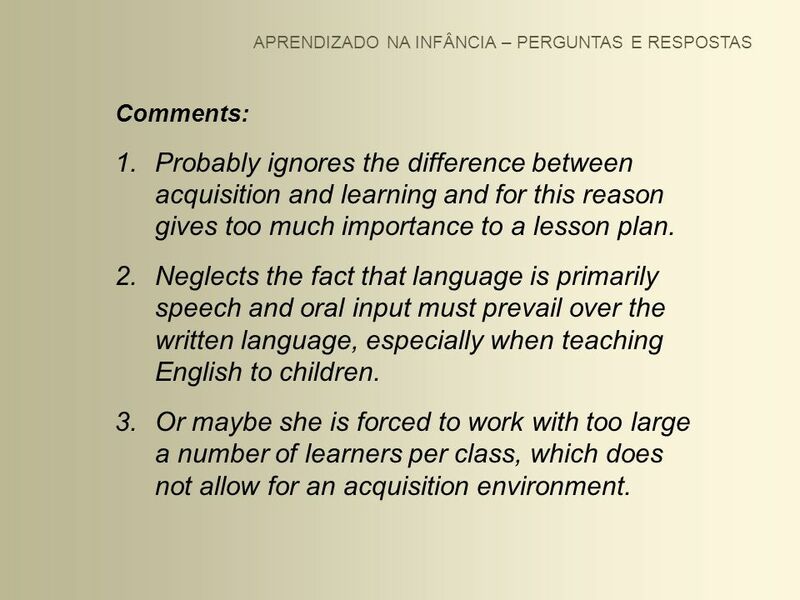 Comments: Mother and teacher probably ignore the concept of natural acquisition and don’t really understand how children learn languages. Her story also shows that being in a foreign country does not necessarily mean being in the foreign language environment. 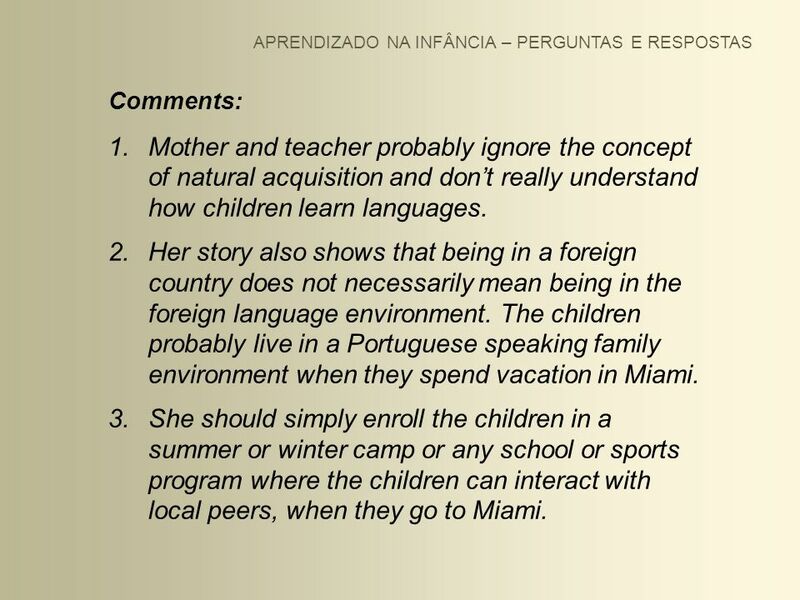 The children probably live in a Portuguese speaking family environment when they spend vacation in Miami. She should simply enroll the children in a summer or winter camp or any school or sports program where the children can interact with local peers, when they go to Miami. 37 Q #393: As crianças misturam línguas? Comments: Ignores or forgets that languages have distinct phonetic characteristics. Ignores the even more important fact that language is always a prominent feature of the environment we are in and an essential part of the relationship we maintain with people. When we learn a language, we do so as a result of the interaction with the people that speak that language. 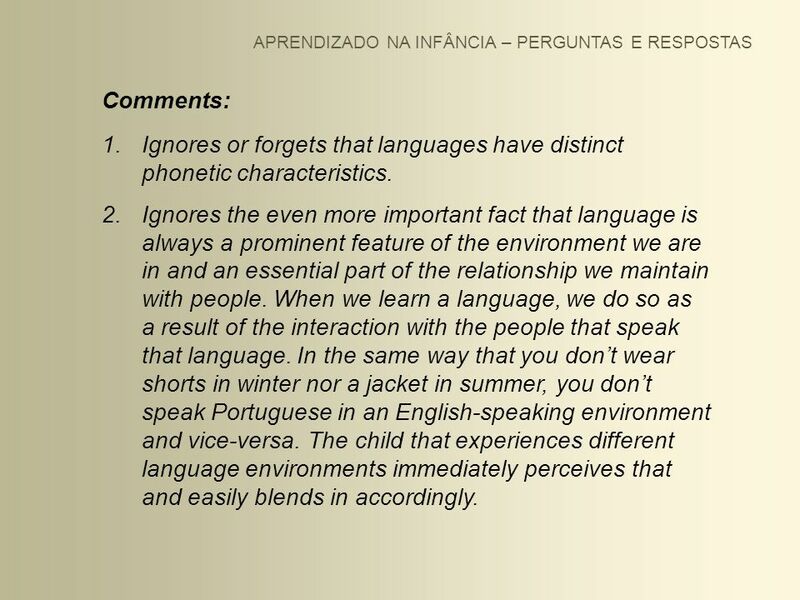 In the same way that you don’t wear shorts in winter nor a jacket in summer, you don’t speak Portuguese in an English-speaking environment and vice-versa. The child that experiences different language environments immediately perceives that and easily blends in accordingly. 39 Q #398: Problemas com a ortografia do inglês. Comments: The problem of spelling in English is a natural problem because of the poor correspondence between pronunciation and spelling. Youngsters in English-speaking countries have the same difficulty. She is on the right path but maybe it is time to introduce reading and writing activities. 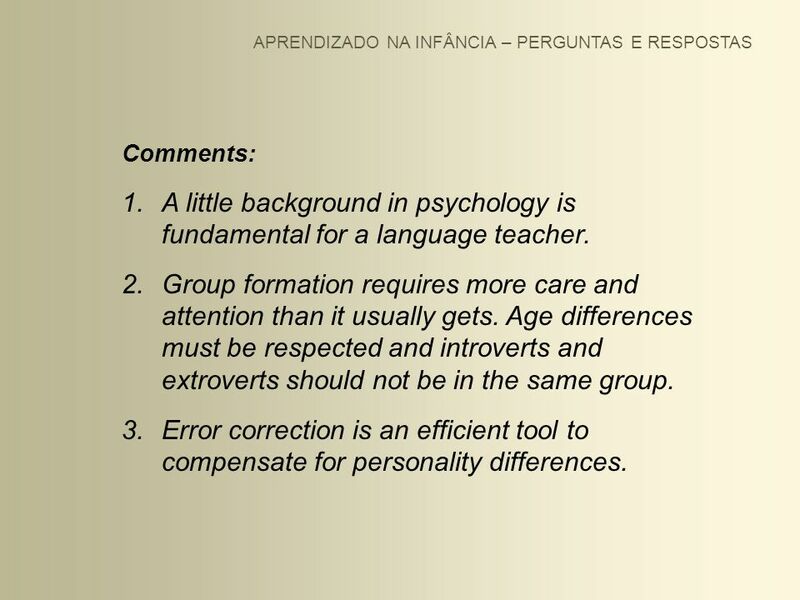 41 Q #400: Importância da homogeneidade do grupo e "error correction"
Comments: A little background in psychology is fundamental for a language teacher. Group formation requires more care and attention than it usually gets. Age differences must be respected and introverts and extroverts should not be in the same group. Error correction is an efficient tool to compensate for personality differences. Comment: It is difficult to have more than one language in the same environment, but not impossible. 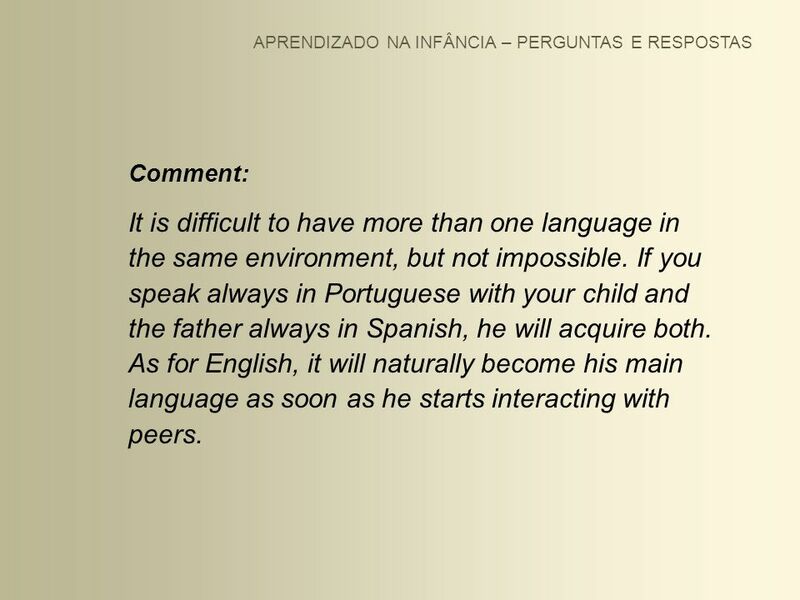 If you speak always in Portuguese with your child and the father always in Spanish, he will acquire both. As for English, it will naturally become his main language as soon as he starts interacting with peers. Comments: In spite of a respectable academic background and practical experience, she doesn’t seem be on the right path. The important thing is to connect with the children, leading them on various activities. Improvisation is the key when working with them. Books and CDs have an insignificant role, perhaps useful only as support materials for practice at home. 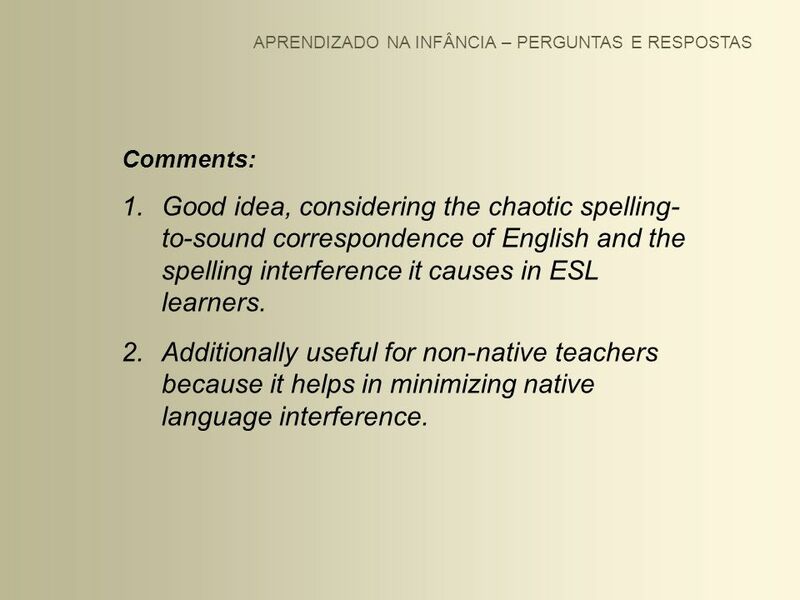 Comments: Good idea, considering the chaotic spelling- to-sound correspondence of English and the spelling interference it causes in ESL learners. Additionally useful for non-native teachers because it helps in minimizing native language interference. 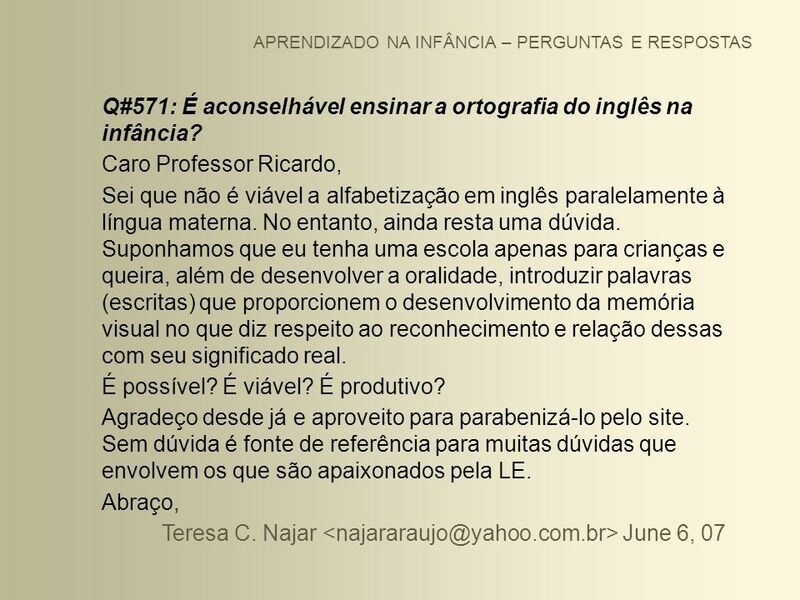 49 Q#571: É aconselhável ensinar a ortografia do inglês na infância? 50 Language is primarily speech. APRENDIZADO NA INFÂNCIA – PERGUNTAS E RESPOSTAS Comments: Language is primarily speech. The English correspondence between spelling and pronunciation is extremely poor. 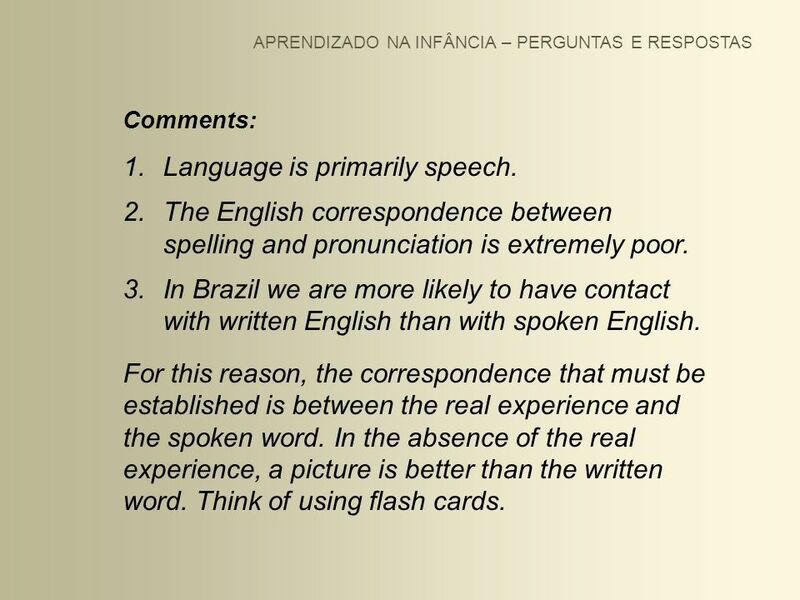 In Brazil we are more likely to have contact with written English than with spoken English. For this reason, the correspondence that must be established is between the real experience and the spoken word. In the absence of the real experience, a picture is better than the written word. Think of using flash cards. 51 De quem é a responsabilidade? 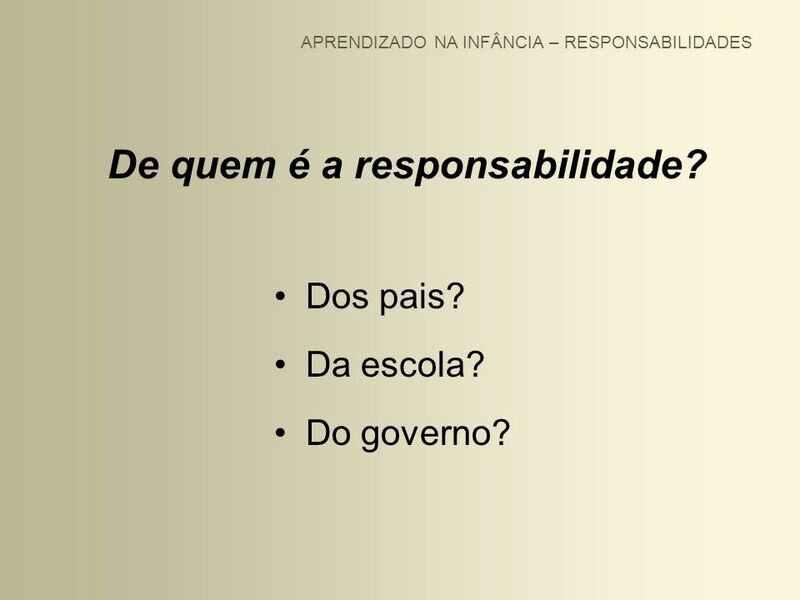 APRENDIZADO NA INFÂNCIA – RESPONSABILIDADES De quem é a responsabilidade? Dos pais? Da escola? Do governo? PAPEL DOS PAIS A responsabilidade dos pais é saber encontrar um ambiente de convívio que proporcione language acquisition para seus filhos. Não devem colocá-los em clubes, cursinhos ou escolinhas onde normalmente instrutores falam português e possuem proficiência limitada em inglês. Sotaque, pobreza idiomática, limitações de vocabulário e outros desvios que normalmente caracterizam aquele que não é nativo serão transferidos à criança, levando à internalização dos mesmos e causando danos irreversíveis. Seria como colocar a gema bruta nas mãos de um lapidador aprendiz. Os pais devem começar a exigir ambientes de language acquisition, principalmente daquelas escolas particulares cujos resultados financeiros não justificam nenhuma postergação. 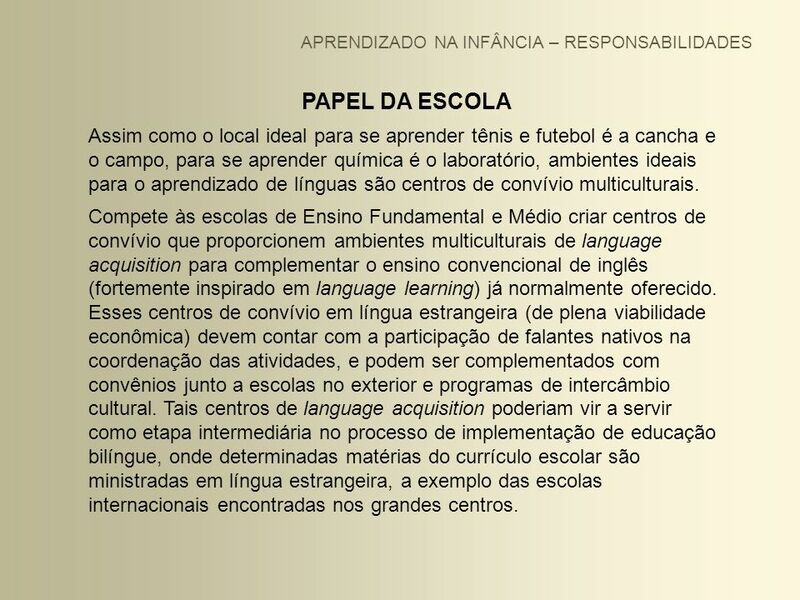 PAPEL DA ESCOLA Assim como o local ideal para se aprender tênis e futebol é a cancha e o campo, para se aprender química é o laboratório, ambientes ideais para o aprendizado de línguas são centros de convívio multiculturais. Compete às escolas de Ensino Fundamental e Médio criar centros de convívio que proporcionem ambientes multiculturais de language acquisition para complementar o ensino convencional de inglês (fortemente inspirado em language learning) já normalmente oferecido. Esses centros de convívio em língua estrangeira (de plena viabilidade econômica) devem contar com a participação de falantes nativos na coordenação das atividades, e podem ser complementados com convênios junto a escolas no exterior e programas de intercâmbio cultural. Tais centros de language acquisition poderiam vir a servir como etapa intermediária no processo de implementação de educação bilíngue, onde determinadas matérias do currículo escolar são ministradas em língua estrangeira, a exemplo das escolas internacionais encontradas nos grandes centros. PAPEL DO GOVERNO Nada cresce do nada. Para disseminar línguas e culturas estrangeiras no país precisamos trazer representantes dessas línguas e suas culturas. Nossos meios acadêmicos não têm como suprir esta necessidade. Por isso, a responsabilidade do poder público é abrir urgentemente as fronteiras culturais, facilitando a vinda de falantes nativos de línguas estrangeiras através de um enquadramento legal específico e burocracia simplificada, bem como incentivando a criação de organizações voltadas a intercâmbio linguístico e cultural e promovendo a isenção fiscal das mesmas. 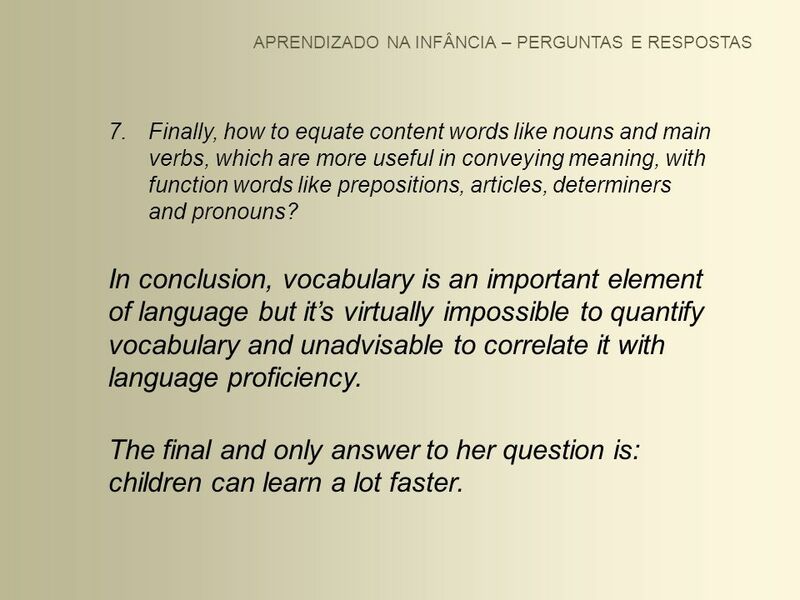 Carregar ppt "PERGUNTAS E RESPOSTAS SOBRE O APRENDIZADO DE INGLÊS NA INFÂNCIA"
Hello pessoal de casa! 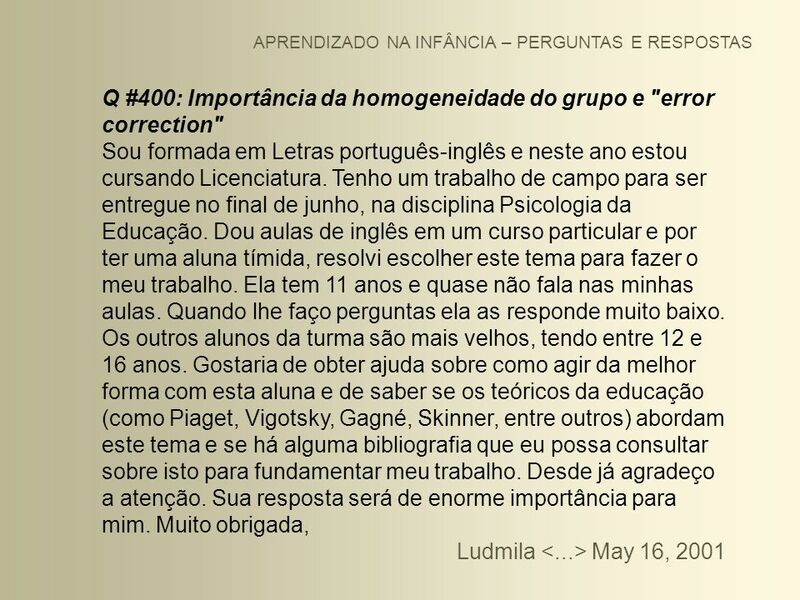 Meu nome é Sílvia e sou a professora de inglês do 1º período! Nas primeiras semanas de aula usamos o nosso tempo para nos conhecer. By Búzios Slides Sincronizado com a Música All For Love Bryan Adams & Rod Stewart.